A place to refresh your love of music, your wonder in children, and your peace in parenting well. It's a busy morning and family's are packing up and heading out the door to their special day - it's a Kindermusik day!! Children are excited and moms slightly frazzled trying to get to class on time, while getting one or more children into their outdoor jackets, boots, and mittens. But once children arrive they are engaged in exploring the early arrival toys, playing with the balls or spending a few minutes telling me about their latest projects or adventures. Happy hearts are everywhere!! 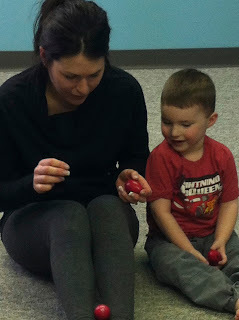 Kindermusik class is a time to feel connected, adventurous, and capable! A time to explore instruments, make friends, and feel the awesome power of making music with others! A time to smile and twirl and feel and try new things. BUT, here's the beautiful thing...for parents who take on the role of Kindermusik facilitator at home by jumping in with both feet and doing Kindermusik throughout the rest of the week, the learning seeps into deeper layers of understanding. In the same way that your child likes to read the same books and watch the same movies over and over again, young brains are designed to crave the reinforcement of repetition. Seeing or experiencing something for the first time always feels a little strange, but the next time it is a bit more comfortable, and the third time it feels familiar and easy. Repetition at home helps your child to see that not only is music fun in class, it is part of LIFE! NO activity we do in class will be more important than having mom or dad involved with a child in doing it at home. What??!! It's true! When we introduce an activity in class, we are familiarizing your children with ideas and examples that can be played out in THE REST OF THEIR WAKING DAYS! Make lunch into a musical adventure by singing about the food - eg. "this is the way we eat our ___"
Class is the introduction, the spark. The home and family involvement is where the big difference is made between being weekly "entertainment" and lifelong passion, and brain enhancer. Posted by Heather at 7:59 p.m.
"Use what talents you possess: the woods would be very silent if no birds sang except those that sang best."